Map of the historic County of Namur. 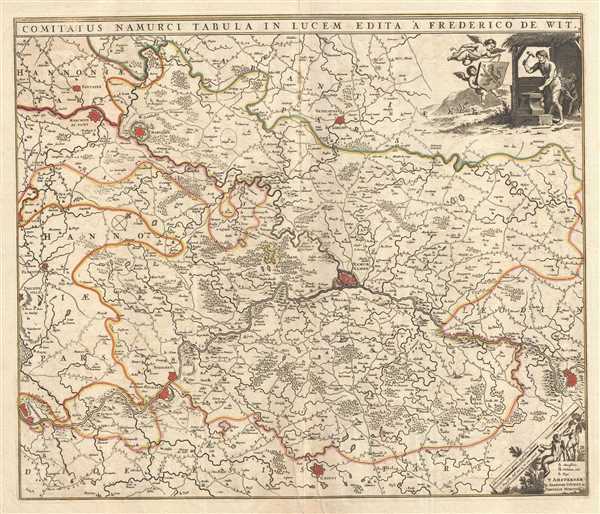 This is an attractive c.1721 map of the County of Namur by Frederik De Wit. Centered on the fortified city of Namur, the map extends from Fortaine (Fortaine-l’Eveque) to Huy and from Gembloux to Florennes. The entire region is depicted in extraordinary detailed, offering both topographical and political information, with forests and mountains beautifully rendered in profile. In the 17th and 18th century, Namur changed hands several times, from the Spanish to French to the Dutch and the Austrian house of Habsburg. A beautifully engraved title cartouche in the top right quadrant of the map depicts two blacksmiths and two angels carrying the coat of arms of the county. In the bottom right quadrant, two angels hold up the scale. The map was printed shortly following the 1721 Covens and Mortier acquisition of De Wit's plates from Maria De Wit. Very good. Minor wear and verso repair along original centerfold. Verso repair over damage near centerfold. Some spotting.